Prelude – Kindly note that today is a Roll-on-News-Day ( Old news published in a new avatar by the newspapers), hence we are publishing this article instead. Any news that may have been left over will be covered in upcoming daily current events post. Background :- South China Sea (hereafter referred as SCS) , has been in news for past few years, but the confrontation has never grown out of context or become large enough to be a major flash point in international geopolitics until now. The SCS confrontation has now taken a global dimension which led to rather self restrained president such as Barack Obama to take bold steps such as sending US naval vessel to enter into the water of SCS. How the SCS conflict unfolds is a case to watch out for, but to understand the future , it is necessary to understand the past and present conditions of confrontation. The South China Sea area comprising of islands, rocks and reefs are considered strategic, economic and political assets for the littoral states in the South China Sea because, they can serve as legal base points for states to project their claims of exclusive jurisdiction over waters and resources in the SCS. The sea is believed to be harboring large reserves of oil and natural gas and is in demand for its rich fishing. With the rise in demand for energy resources, the disputes in the area have been further exacerbated. It is a critical navigational waterway in this region which is used from the west of the Indian Ocean to East Asia. The island groups and the security of the sea lanes (marine terrorism, piracy, marine ecosystems) have been perceived as important since it is an important shipping lane and ASEAN, India, Taiwan, China, Japan and South Korea are all heavily dependent upon international and extra regional trade-most of which is shipped through the area. 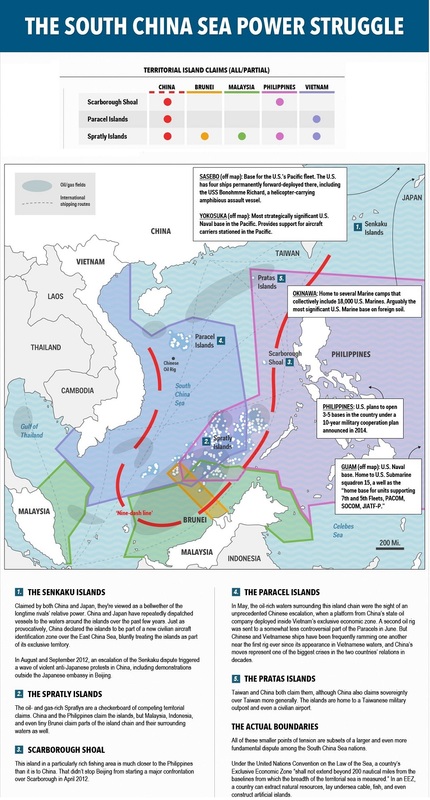 As economies develop, the SCS is fast becoming the focus of tension. The straits that separate these islands are important not only because restrictions upon passage would seriously disrupt international commerce but also because control over the islands would permit dominance over those routes. Although the assertions of sovereignty, rivalry over maritime resources, nationalism and attempts to consolidate jurisdictional and legal claims have been long standing issues where actions by one claimant or another has drawn reaction from others, it is China’s assertive actions backed by modern maritime enforcement capabilities that are proving to be a cause of concern. As such, China receives the greatest attention because it is by far the most powerful claimant and has the record of using force to pursue its territorial claims. near and far has become an unstated “core issue”. As defined by the Chinese officially, core issues are those that must be protected and secured by any means including military measures. China has been relentlessly increasing its capacity to exercise control over the Sea by strengthening its capacity and capability to establish its increasing maritime domain area (MDA) and its emergence as Asia’s pre-eminent naval power. These moves taken by Beijing also indicate its growing aggressiveness and unilateralism, which clearly go against the spirit of the 2002 DOC (Declaration of Conduct of parties), a multilateral political document agreed upon by the ASEAN and China that calls for resolution of ‘territorial and jurisdictional disputes by peaceful means, without resorting to the threat of force. 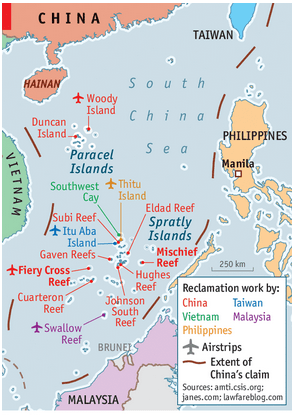 It is a dispute over territory and sovereignty over ocean areas, and the Paracels and the Spratlys – two island chains claimed in whole or in part by a number of countries.Alongside the fully fledged islands, there are dozens of rocky outcrops, atolls, sandbanks and reefs, such as the Scarborough Shoal. To sum up the confrontations are around two major islands :- Paracel and Spratly island ; and Scarborough Shoal. been growing and hence, it is crucial that freedom of navigation is maintained in the South China Sea through which the trading routes between India and these East Asian countries pass. India’s sea bound trade that passes through Indian Ocean constitutes 92-95 per cent of its total trade and, there are estimates that nearly 25 per cent (and growing) of this sea bound trade passes through South China Sea. India like China is also energy deficit country and is stretching its resources all over the world to access hydrocarbons in what ever form and quantity available. India’s oil and gas exploration and extractions in Myanmar and Vietnam need to be understood in this respect. Therefore, there is no way that India would retreat from South China Sea just because China or any other country has taken an exception to its economic and naval activities in this region. Meanwhile, India-ASEAN trade has reached US$ 57.89 billion in 2010-11. Any major conflict in the South China Sea region is bound to impact Indian economic interests. 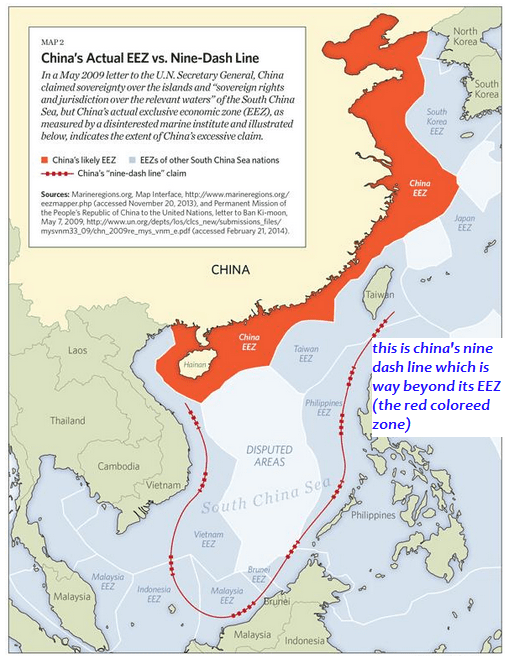 Besides, India is worried that if China controls this sea space it will dictate maritime traffic, both civilian and military. Therefore, its priority is to maintain freedom of navigation in the sea both merchant and naval ships. India is of the opinion that the SCS region was a key to its energy security, and that the conflict must be resolved peacefully as per international laws. The activities of China in SCS, puts India in a disadvantageous position , it is also meddling in the Indian Neighborhood states such as Nepal, Srilanka and Pakistan.Thus it is a greater concern for national security of India. The way forward is a complex architecture of diplomatic re-balancing , which is yet to be fully realized by India, the Indian counter being Project Mausam which is still in incessant phase. P.S. 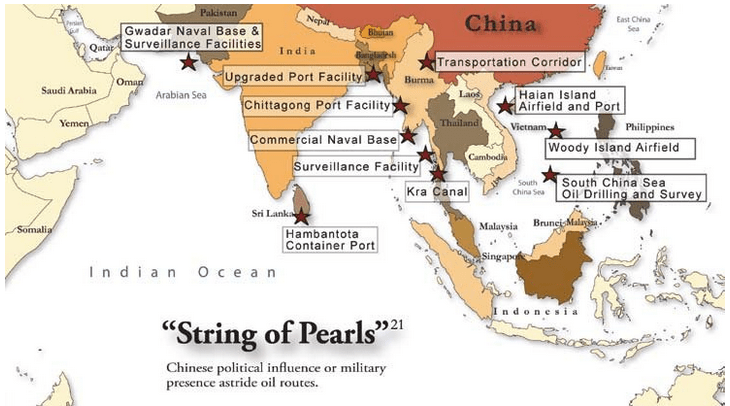 – Kindly note down the ports in String of Pearls map and other important areas , as UPSC is known to ask the question related to it – both subjective and objective.